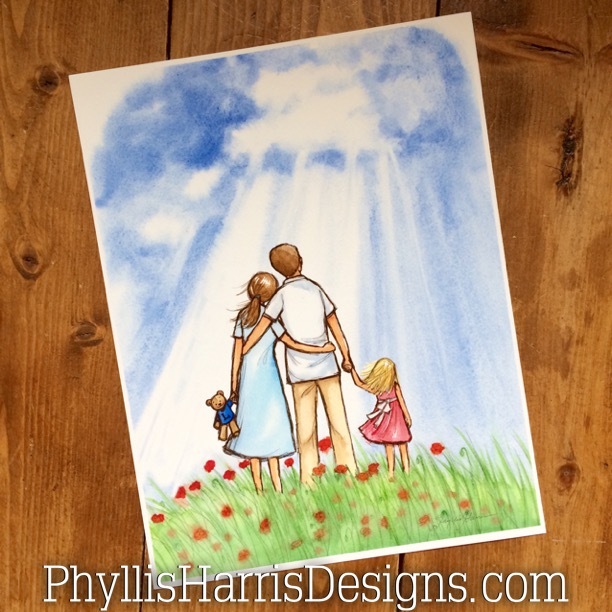 Did you know that every art print you order from Phyllis Harris Designs is handmade by me? This is a recent photo taken in my studio(the clean-ish corner) where I create all my art for my shop, print all my own prints for my shop, build all my own canvases for my shop each and every day for Phyllis Harris Designs. 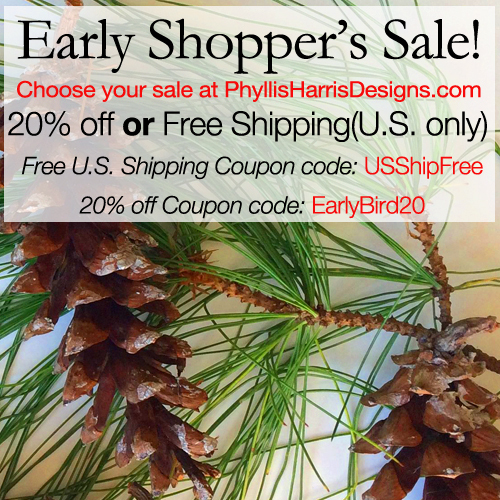 Did you know that every art print you order from Phyllis Harris Designs is handmade and packaged and shipped by me?! Yep, just little old me. And yes, I am bare foot. 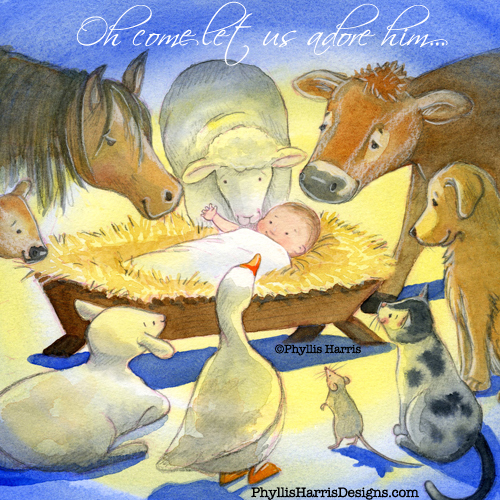 Now, you know why so many of the little children in my art are bare foot! My favorite way to be! It's been a very long dry spell. It's been a very long dry spell with my being able to sit down and draw or paint. A form of this doodle has been in my sketchbook for a while now… I think it's finally time to bring it to life.Here is the first rough sketch. It is a work in progress. Last minute gift...no shipping required! The holidays can be so wonderful but I know that there are also those who struggle at this time of year with poor health or loneliness so I hope you will join me and remember to reach out to those in need not only at Christmastime but all year round. For those of you that still have those last minute gifts to buy, I am offering gift cards for a limited time in my shop. These come in a number of different price variants to choose from. No shipping required on these because they come to your email box with a special code that can be used to purchase anything in the shop so even if it is the day before Christmas and you still haven't gotten a gift for that special someone, no worries...this gift is available as soon as you place the order and with Phyllis Harris Designs gift cards, customers purchase gift cards the same way they purchase any other product. 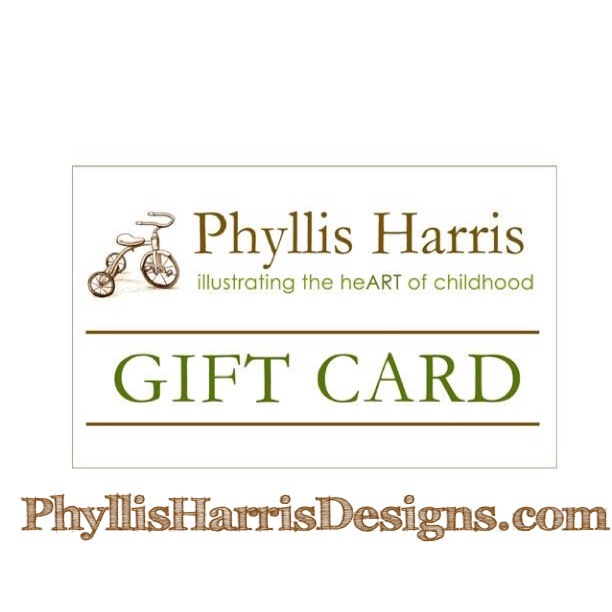 And unlike a gift certificate, the shopper can spread the gift card balance over multiple visits. I want to wish you all a very Merry Christmas and healthy and Happy New Year! Thank you for making my year so successful and happy. I couldn't do what I do without ALL of you!